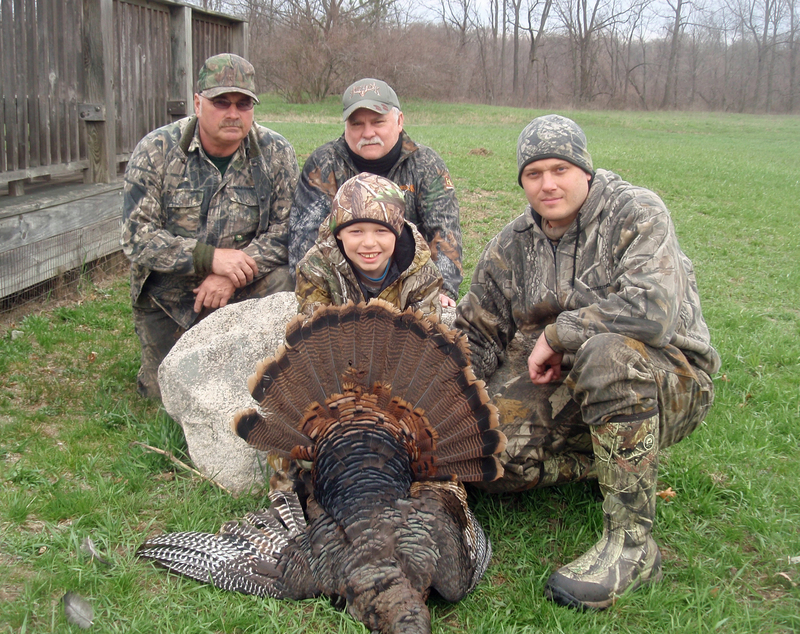 Cameron Edgerton shot this 14-pound turkey while being mentored by his uncle, John German. Behind them are guides Bruce Waterman, left, and Dennis Neibarger. Photo: Courtesy. MUSKEGON, MI — At a time of day when most youngsters are comfortably home in bed, Evan Rogalla sat calmly in a moonlit field, waiting. Dawn was approaching. It wouldn’t be long. The 13-year-old hunter sat still in his blind with his father and grandfather. Across the field, a group of wild turkeys soon started gobbling. They flew down from their roosts 500 yards away and began to squabble. It would be a while before they rushed the blind, drawn by the hunter’s enticing calls. When they did, they came with seven hens calling and three jakes gobbling. 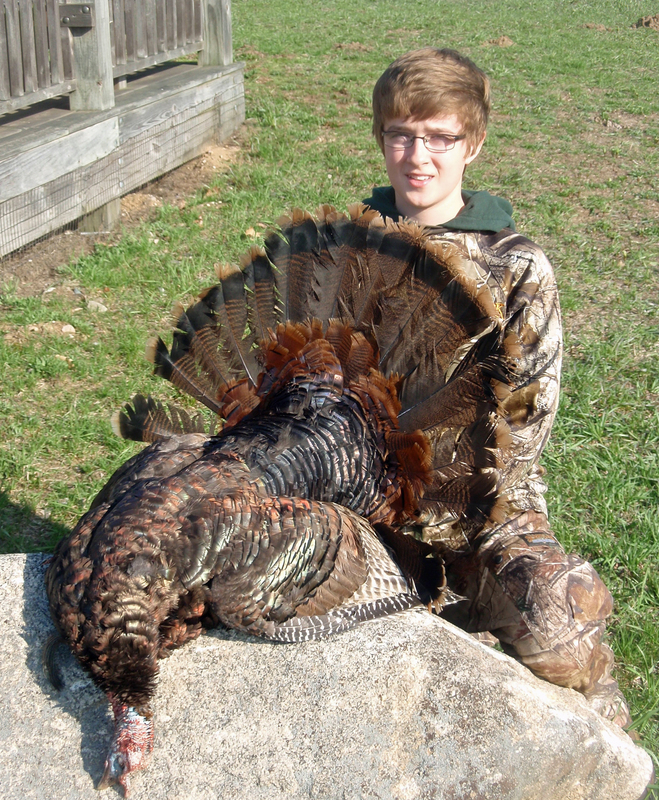 Evan dropped the biggest male bird with one shot from a 20-guage shotgun, a 20-pound wild turkey with a six-inch beard. He would be one of four successful hunters that weekend in a special youth hunt at the Muskegon County Wastewater Facility, organized by the Muskegon River Bottom chapter of the National Wild Turkey Federation. It is that kind of scrutiny that makes “mentoring” a meaningful term, a guided and well-counseled experience where constructive feedback comes quickly, and undesirable behavior can be extinguished just as fast. The gobbler was Evan’s fourth since starting to hunt. He’d shot the others also under his grandfather’s tutelage and that of his father, Alex Rogalla. Three other Muskegon area youngsters also did well that weekend. Austin Fowler, Corey Vanderputte and Cameron Edgerton all are 9-year-olds that went home with a bird. Each was hunting with a Michigan mentored youth hunting license. The license allows children 9 and younger to hunt small game, wild turkey and deer. It allows them to fish and trap, too. Hunter Safety classes are not required to hunt, but the youngsters are required to go with a mentor, someone 21 years or older who has prior hunting experience and a valid hunting license. I can say honestly that I have had some questions about the wisdom of letting such young children handle a gun, but what became clear this weekend is the mentored youth program can and does work when parents or legal guardians approach it seriously. hunt. She got a shot at a turkey using a crossbow and missed. He spent the second day supervising his nephew, Cameron. Cameron’s first shot was low. It knocked the big bird down, but it would take three shots to finish it off. In the end, the young hunter came away with a lesson learned. His uncle, and their two Muskegon-area guides, Bruce Waterman and Dennis Neibarger, were on hand to help. The adults on the hunt were there only to be in service to the children, whether to help with calling or to supervise the young hunters closely. The Muskegon hunt was one of four special youth turkey hunts around the state that weekend, including one in the Battle Creek area, Belding area and the Upper Peninsula. Each had been organized by a local turkey hunting group and was designed to introduce mentored hunters to the sport of turkey hunting. Only 2,256 mentored youth licenses were sold in 2012. That’s a far cry from the number that mentored youth hunting proponents hope will be sold over time as means to stem the decline in hunting license sales. But it is a start, and a good one. And conservation groups like the NWTF are to be commended for their efforts. “Cameron is already asking when deer season starts,” German said. He is 9 years old and already he has the right idea. This entry was posted in Uncategorized and tagged DNR, Hunting, Michigan Department of Natural Resources, National Wild Turkey Federation, Turkey Hunt, Turkey hunting, wild turkey. Bookmark the permalink.